An hour later, I leave to meet a writer friend for coffee. I love meeting other writers for coffee or lunch. It’s social; it’s fun. But it’s also a writerly sort of activity, so I can feel virtuous about it. Fun and virtue together – how often does that happen? We meet at Peet’s, seven-tenths of a mile from my house, so I walk. I need the exercise. 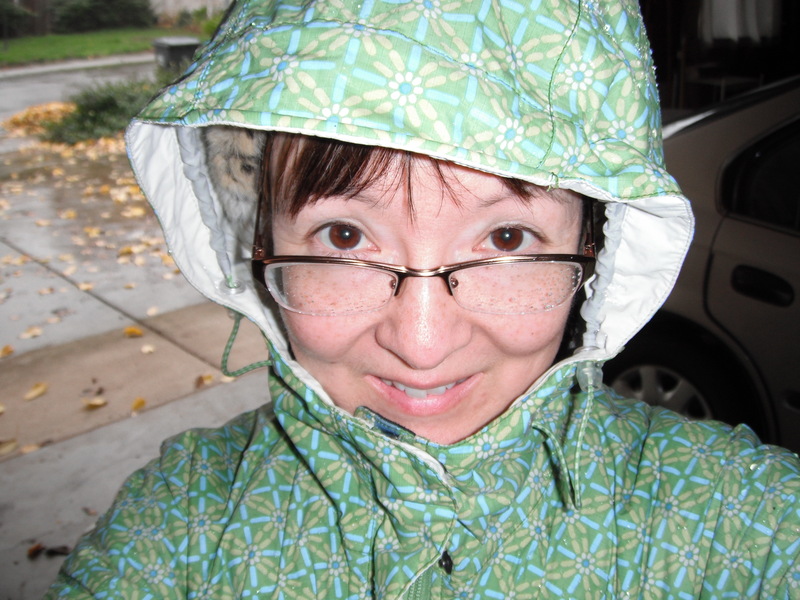 Besides, what better excuse is there to wear my lime-green raincoat? I was so happy the day I saw it in the Lands’ End catalog and realized I could buy it because I was finally old enough to stop caring about looking like a grown-up. The rain is driving in at a slant from the southeast. My calves get drenched on the way there, my shins on the way back. Going home, I pass downed tree limbs that hadn’t been there when I walked by an hour earlier. I walk the rest of the way in the street, well away from overhanging branches. It’s worth a short walk in the cold and wet just to enjoy the sensation of putting on dry clothes again. I check our sunroom. The latest fix, a giant roof shingle that two guys spent one morning last week hammering down, seems to be holding. The containers we’ve set out to catch the drips are dry. Through the window is our backyard. I’ve been bugging my husband for weeks to tie up his fava beans. Every year he plants them, and every spring they fall down in a storm like this one, their tough, hexagonal stalks folding in the wind. Our sugar snap peas are in trouble too, pulling away from their trellises. The supple branches of our lilac tree are bent almost to the ground by the wind and rain, swaying up and down as if bowing to someone. It’s a California native; it should be able to handle this. But I wish now I had pruned it a little or secured it somehow to the fence behind it. My children have been lucky this winter. It seems to stop raining most days exactly when school gets out in the afternoon. Today I’ll be tutoring when they get out, so they’re on their own regardless. But they’ll be fine. They’re California natives too. I love rain, too, if it’s not a cold windy rain; then I don’t. But rain makes everything so fresh and sparkling. The colors all become more vivid.